The pre-season of 2004/05 was a busy period for the club, as Ernie Tippett and Stewart Robson looked to effectively rebuild the squad for the forthcoming campaign. New signings included defenders Sean Connelly, Graham Allen (both from Tranmere Rovers), Peter Hawkins and Rob Gier (from MK Dons). Phil Gulliver also arrived along with Craig Dove (a winger) from Middlesbrough. Alex Hay and Gareth Seddon were also brought in to provide more attacking options. Before the fixtures for the 2004 / 05 campaign were announced, there was a great air of anticipation around Nene Park, in fact, around Northamptonshire. Everyone was eager to find out when Rushden and Northampton Town would lock horns, having missed each other the previous season, after Rushden won Division 3, and Northampton were relegated from Division 2. The two sides would not have to wait long to meet. Rushden would travel to the Sixfields Stadium after an opening day home tie against Kidderminster Harriers. After drawing the opener with Kidderminster 0-0, Rushden went down 1-0 to Northampton, after Eric Sabin struck late on in the game. Injury and illness denied Gareth Seddon the opportunity to pull on a Diamonds shirt, so Ernie Tippett and Stewart Robson would utilise the loan system. Kevin Braniff arrived from Millwall on a three-month loan, and he scored vital goals in 1-0 wins against Grimsby and Cheltenham. The highlight of the opening half of the season was Rushden’s 5-1 thumping of Notts County at Nene Park. New loan signing Drewe Broughton scored a hat trick, the first of the three coming after just ten seconds. However, a run of 13 league games without a win would ultimately spell the end of Ernie Tippett and Stewart Robson’s reign at Nene Park. Barry Hunter took charge for his second spell as Caretaker Manager, and got off to the best possible start, with a 2-0 win over Leyton Orient. Hunter had reignited the passion and determination that Rushden had missed for so long, and he also made some excellent loan signings to strengthen the squad for the battle ahead. Scott Shearer was brought in from Coventry City, to fill the troublesome Goalkeeper slot following Billy Turley’s departure. Hunter also brought in Neil McCafferty , a young Irish midfielder from Charlton, and Mark Williams, a Northern Ireland international, loaned in from MK Dons at centre-half. Drewe Broughton returned for a second spell at Nene Park, to forge an strike partnership with Billy Sharp, an eighteen year old from Sheffield United. 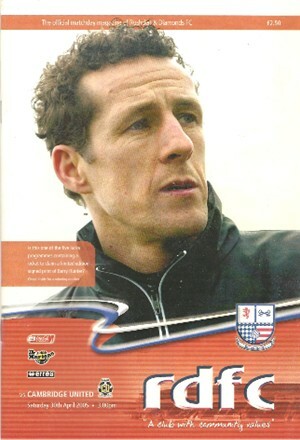 Rushden were becoming quite a force at home under Hunter, and the highlight of the season would be March 12th, 2005. Rushden played Northampton at Nene Park, and with the game level at 2-2 in injury time, Luke Chambers misjudged a clearance-come-pass from Rob Gier, allowing Sharp to steal in and slot the ball past the Cobblers’ goalkeeper as the Rushden fans went wild. Safety was guaranteed despite the loss of the final two matches of the season to already relegated Cambridge, and promotion chasing Macclesfield. Kidderminster were the other relegated side. In Summer 2005 Max Griggs stepped down as Chairman and owner of the club after announcing his intention to sell the club in October 2003. The Rushden and Diamonds Supporters Trust, made up of supporters of the club, were formed in order to protect the club. In January 2005 Griggs announced his plans to hand over the Football Club, the Nene Park stadium and 22 acres of land – except the sports and exhibition centre – to the Trust. The Griggs family also provided a cash injection to the Trust of £500,000 for the 2005/06 season, and £250,000 for the 2006/07 season. The game at home to Oxford United on 26th December 2004 was the 700th in the Diamonds History – see here for a reflection on that milestone.